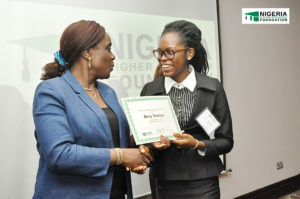 Kemi Adeosun, Nigeria’s Minister of Finance, presenting NHEF Scholars Program certificate to Mercy Ndubeueze (NHEF Scholar ’17). Mercy Ndubueze (NHEF Scholar ’17) earned placement into the Bank of America Spring Insight Program in London. She is majoring in economics at the University of Ibadan. Through the program, Mercy will receive additional exposure and skills development in two business areas of her choice; these include The Global Banking & Markets Wholesale Credit, Global Corporate & Investment Banking, Global Transaction Services, and Technology.